Based on the classic novel Le Fant�me de L'Opera by Gaston Leroux, THE PHANTOM OF THE OPERA tells the story of a masked figure who lurks beneath the catacombs of the Paris Opera House, exercising a reign of terror over all who inhabit it. He falls madly in love with an innocent young soprano, Christine, and devotes himself to creating a new star by nurturing her extraordinary talents and by employing all of the devious methods at his command. "...The main Christine on this tour is a fine and very honest young soprano named Katie Travis, a principal whom it's easy is to believe just moved up from the ballet, as does Christine, of course. Like a lot of actors in this show, Travis clearly is having fun playing so famous a part. Jordan Craig sings beautifully as Raoul, as does Trista Moldovan as Carlotta. Both know when to leave space for the stars, warbling for your pleasure in throat-killing temperatures." 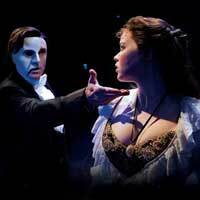 "...Smart direction and set design aren�t the only tricks this �Phantom� has up its sleeve, however. The current touring production is exceptionally cast. As the Phantom, Broadway vet Derrick Davis comes across less menacing then other Phantoms I have seen. Instead, he focuses on emphasizing the disfigured creature�s tortured soul and unrequited love for operatic ingenue Christine (Katie Travis)." "...Like the grand opera traditions it spoofs, "Phantom" -- with lyrics by Charles Hart and book by Richard Stilgoe and Webber -- is the glorious embodiment of excess. From its melodramatic plot (based on Gaston Leroux's 1910 novel) and bombastic ballads to its stunning costumes and stellar effects (including the famous falling chandelier), this musical about the pursuit of art represents excess with a capital E."
"...The longest-running show on Broadway returns to Chicago with a splashy new production from original producer Cameron Mackintosh. And for those familiar with and fond of the Andrew Lloyd Webber classic, the cast and orchestra of 52 (which makes Phantom one of the largest productions on tour in North America) delivers as many sparks as the iconic chandelier." "...The life of The Phantom of the Opera is proof that music is the link between cultures, the universal language. Andrew Lloyd Webber�s Phantom of the Opera opened last night at the Cadillac Palace Theatre to a dazzled full house, bringing the much loved and longest running Broadway musical back to Chicago." "...Andrew Lloyd Webber�s mega-musical wants to be an opera about opera to end opera. Ironically, �Hannibal,� its first-act spoof of a 19th-century grand opera of the Meyerbeer persuasion, is no more overwrought or grandiloquent than the show that surrounds it, beloved as it is by countless legions. Like Webber�s early hit Joseph and the Amazing Technicolor Dreamcoat, the score is a pastiche, its ardent homage stretching from Frederick Loewe to Giacomo Puccini." "...Amazingly, Phantom still holds up as fine entertainment. Put your mind on hold, suspend disbelief, and enjoy this big bon-bon of a show. You'll leave the Palace humming the tunes, which is a sign that the show hit its mark. This is how all touring shows should be - Equity talent with all the necessary stage craft." "...�The Phantom of the Opera� is back in town, and while many have seen this fabulous work by Sir Andrew Lloyd Webber, many times, this particular production has been changed to bring new life to an already exciting and haunting musical theater experience. In fact, this is a musical that comes close to actually being an opera ( a close second to �Porgy and Bess�, for sure)!" "...The king of all blockbuster musicals (sorry, Hamilton), The Phantom of the Opera continues to astonish in a large-scale, exquisitely-rendered production that that is cutting no corners on its national tour. If you haven't seen this yet, don't delay as it won't be in Chicago long." "...The Phantom of the Opera is a well-loved Andrew Lloyd Webber musical that has entranced audiences with its tale of tragedy, love and music since its premiere in London in 1986. The latest Broadway in Chicago touring production continues the tradition of excellence with an epically large 52-member cast and orchestra." "...The singing, choreography and talent is overflowing from the rest of the cast and orchestra of 52. The rousing number "Masquerade" stands out as an incredible feat by choreographer Scott Ambler. The splendor of the Phantom is lastly topped off by an amazing set-with moving chandeliers and towering structures-this musical displays everything a good show needs. Cure your post-holiday blues with a trip to Broadway in Chicago." "...WOW! The chandelier explodes above you, flames appear, and you watch the leads rowing a boat through mists to an imagined fortress getaway of the reclusive title character Phantom. And the show has barely begun!"